This is a great harness for your furbaby. Colors for boys and girls. Now with three new sizes: .. If it's time to update your special pup's harness, look no further. The latest in the ..
Give your dog a splash of color in the trendy new harness with unique color blending that causes a r.. Your dog will be ready for summer in this soft mesh dog harness. It has a touch of flare with .. This soft mesh dog harness is ultra choke free so your dog's trachea is safe. This new spe.. These super soft and adorable harnesses are lined and trimmed in Super Plush Minky Fur for comfort a..
How handsome your little fella will look in the Northern Lights dog harness which is made using a sp.. This ultra choke free soft mesh dog harness is so adorable with its unique color blending that allow..
Every dog needs something bright and cheery to wear. Won't your dog be all the talk at the.. This dog harness is the perfect Spring/Summer harness for your dog. Made of soft mesh with a u.. 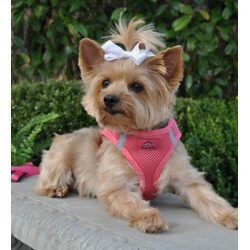 This Cool Mesh Dog Harness and Leash set are perfect for hot summer days. It is trimmed in red..